c. the payment of wages disguised as trusts, loans, transfers of assets and rights, loyalty points bonuses and shares. This thematic discussion will focus attention on two key issues. In Section 1, the extent and character of conventional under-declared employment is addressed and section 2 evaluates how these forms of under-declared employment can be tackled. Section 3 outlines the ‘modern’ emergent forms of under-declaring work and how they might be addressed. Williams, C.C. and Horodnic, I. 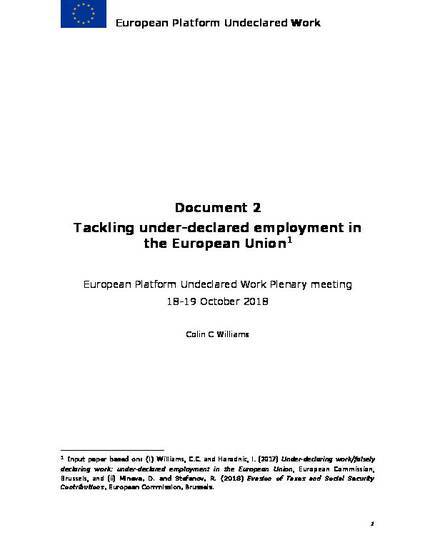 (2017) Under-declaring work/falsely declaring work: under-declared employment in the European Union, European Commission, Brussels.